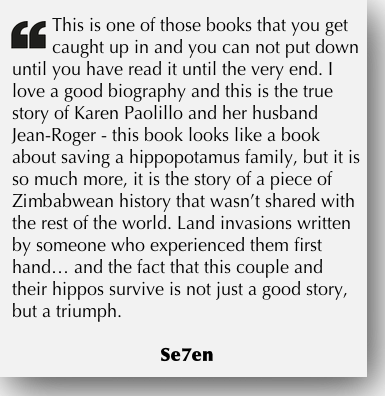 Home » Karen's blog » A Hippo Love Story by Karen Paolillo published by Penguin Books South Africa. Relentless and violent pressure on them to leave their open land and their precious hippos in the hands of poachers during the terrifying time of land invasions. They refuse to leave and they literally fight for their lives and those of the precious hippos… You cannot read a book like this and come away unscathed, the depths that folk like Karen Paolillo are willing to go, way beyond “working hard” to keep the wild animals of Africa in place for generations to come is nothing short of heroic… most of us would have given up and yet she persevered. As the events and larger than life obstacles rise up and place themselves firmly between a peaceful herd of hippos and their survival… you cannot help reading on and on… this book looks like a book about saving a hippopotamus family, but it is so much more, it is the story of a piece of Zimbabwean history that wasn’t shared with the rest of the world. Land invasions written by someone who experienced them first hand… and the fact that this couple and their hippos survive is not just a good story, but a triumph. I have a new conservation hero, her name is Karen Paolillo. 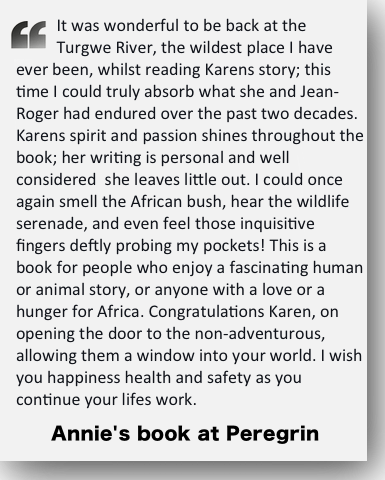 Karen’s newly published book, ‘A Hippo Love Story’ is an account of her brave life in Zimbabwe, which began in 1990 when she and her French husband, Jean-Rodger, first settled alongside the Turgwe River. The river is home to numerous hippo families, and one particular hippo family that become a central part of this important story, as Karen’s life become intertwined with theirs. 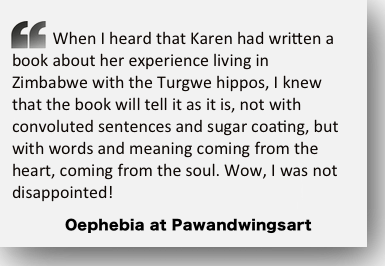 The book opens with Karen’s first Turgwe hippo encounter (a pretty terrifying experience!). In fact, any ‘normal’ person would be traumatised by such an event – but Karen is not ‘normal’ – and I mean this in the best way possible. How many other humans spend six hours a day in the company of hippos? How many people would willingly risk their own lives for these animals, battling drought, floods and worst of all, human greed? It takes guts, perhaps even madness! This is Karen’s life, a life dedicated to saving her beloved hippos. ‘A Hippo Love Story’ is an easy-to-read book in the sense that it is written in simple language, like having a conversation with a friend. Yet as a soft-hearted animal lover, I struggled over it. Reading Karen’s book made the violence in Zimbabwe personal – I had definitely not fully comprehended the reality of the systematic annihilation of Zim’s beautiful wildlife, (under the instruction of the so called ‘war vets’) until now. The havoc that human greed can wreck in the lives of animals (and people), even in the short time frame of a few months is frightening. 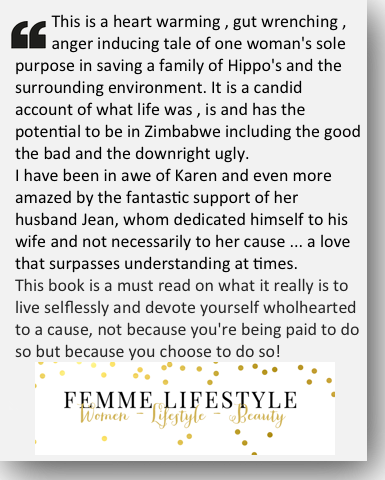 For Karen and Jean-Rodger to remain living in a land so ravaged by evil, and continue to fight for that little bit of remaining hope (In doing so becoming that very hope themselves) takes love of an extraordinary kind – Karen’s love for her hippos. The intelligence and human-like empathy of elephants is well documented, yet hippos are often seen as little more than ruthless man-killers. Karen’s time with the Turgwe ‘river horses’ tells a different story. Hippos have different personalities and temperaments, they have memories not unlike elephants (affecting the way they react to humans), and they even groom crocodiles! 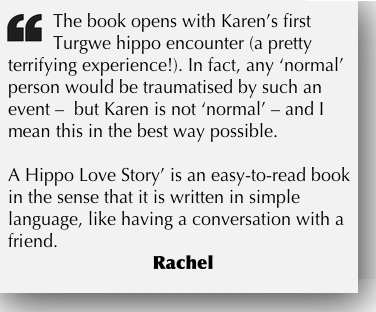 One particular hippo, Bob, is especially special to Karen, inviting her into his world and recognising her by voice. One way of supporting people who dedicate their lives to doing good for our planet is to buy their books. Karen and Jean are one such couple. It does not cost much, provides a good read and helps in conservation of our animals. Reviews on Amazon and other sites say it all. It is a biography that will keep you rivited. Once you start…well say good bye to TV and films..you will want peace and quiet and your copy of “A Hippo Love Story”. As Christmas is approaching…what better way to celebrate than choosing this as a gift for your family and friends. 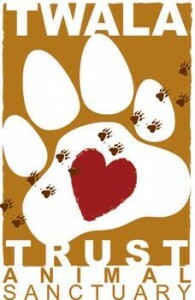 I know it sounds like an ad..but the highest praise and dedication to animals is by supporting it in all possible ways. My faith in humans is badly shaken when I see what humans do to animals. Many turn away shuddering and say , I would rather not know. If we all turn away….who is left..a few kind people like Karen and Jean. Enjoy the book. Karen is unbelievable in everything she does. 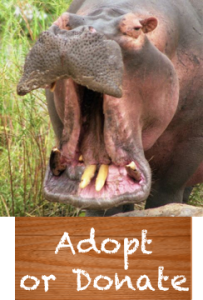 It is very worthwhile to adopt a hippo, and to help her and her husband that way to keep up their great work and their spirit. I adopted a Hippo over ten years ago, and did not have one minute of regret. Karen keeps in touch all the time and tells me how the Hippo’s are doing and what else is going on. My beautiful Blackface was murdered, which brought the terrible situation that the Hippo’s and Karen and Jean Paul were living in into our house.